Custom-built interface and firmware for gaming traffic control. We partnered with Killer Networking, industry leaders in gaming networking, to develop a Wi-Fi router for hard-core gamers. The WRT32X uses the Killer Prioritization Engine to identify, prioritize, and accelerate your gaming traffic above all other devices and activities on your home Wi-Fi. Gaming PCs may experience less than optimal ping rates when the network is under load. When matched with a Killer-enabled PC, the WRT32X gaming router automatically syncs using the Killer Prioritization Engine to reduce peak ping by up to 77%. * The result, unparalleled gaming-conquering response rates no matter what other devices on the network are doing. Enjoy exceptional online gaming performance from specially engineered software. Gaming-optimized firmware works to minimize response times, thus providing a virtually lag-free connection when you need it most: in the midst of a heated competition. You won't lose your edge even if your roommates or LAN party are streaming, gaming, or strategizing with you over voice chat about how to take down the competition. 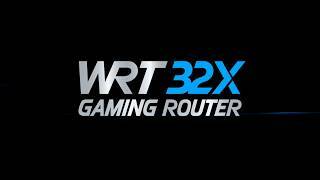 The WRT32X gives you dominating Next-Gen AC Wi-Fi speeds up to 3.2 Gbps that keep you at the top of your game. Experience exceptionally smooth, responsive gameplay. The Killer Priorization Engine will reliably fast-track gaming traffic whether you're using a wired or Wi-Fi connection. The intuitive interface lets you see your home's Internet traffic. You can monitor connected devices, manage advanced networking settings, and conduct speed tests with just a few mouse clicks. With the gaming-focused UI dashboard, you can check network traffic speeds, check VPN and network storage status, see Killer device connection status, and also control port-forwarding. You'll know at a glance whether your PC or console games are performing optimally. Thanks to MU-MIMO technology, the WRT32X Gaming Router can handle even the most bandwidth-intensive environments. MU-MIMO builds upon longtime broadcasting cornerstones--such as spatial multiplexing, beamforming, and scheduling algorithms--to boost overall throughput and distribute bandwidth fairly between devices. Each connected client device receives its own dedicated data stream, so users won't have to compete with one another for bandwidth. Multiple users can simultaneously engage in 4K video streaming, play online games, and perform other data-intensive tasks without latency or buffering. The WRT32X features a performance-grade 1.8 GHz dual-core CPU, custom-built firmware and user interface, four external adjustable antennas with high-power amplifiers, and high-efficiency heatsink. Aesthetically, it boasts a stealthy design, sleek matte-black finish, and blue LED lights-the perfect complement to any gaming environment. Linksys automatically pushes software updates to your router overnight and seamlessly brings the latest features and security to your home network. The WRT32X will be consistently getting better over time. *“Killer reduces peak ping by up to 77%" calculated from the reduction of peak ping rate from 74 milliseconds (ms) to 17 ms when using the Killer Prioritization Engine on the WRT32X and a Killer-enabled PC using a 10 megabits per second (Mbps) down/2Mbps up internet connection that has multiple devices consuming the 10Mbps connection. The standard transmission rates—450 Mbps or 2600 Mbps (for 5 GHz) and 600 Mbps (for 2.4 GHz)—are the physical data rates. Actual data throughput will be lower and may depend on the mix of wireless products used and external factors. Killer is a trademark of Rivet Networks, LLC. All rights reserved. Copyright © Micro-Star Int’l Co., Ltd. MSI is a registered trademark of Micro-Star Int’l Co., Ltd. All rights reserved. ©2017 Razer Inc. All rights reserved. Razer, the triple-headed snake logo, Razer logo, “For Gamers. By Gamers.”, and "Powered by Razer Chroma" logo are trademarks or registered trademarks of Razer Inc. and/or affiliated companies in the United States or other countries. DD-WRT is a trademark or registered trademark of embeDD GmbH.